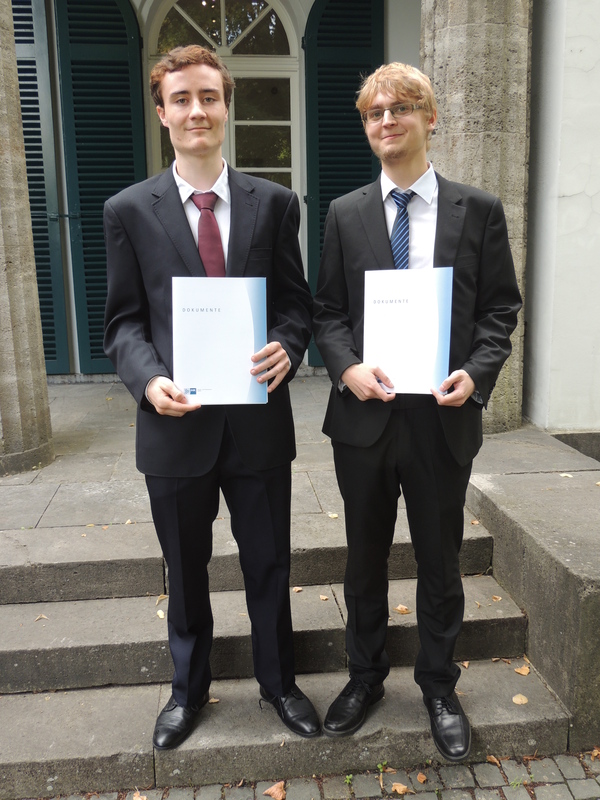 Tobias Lauterbach and Simon Packbier have completed their apprenticeships as mathematical-technical software developers (MATSE). “The vocational training to become a MATSE is the Rolls-Royce among the dual-educations”, claimed Gisbert Kurlfinke, vice-chairman of the chamber of commerce Aachen, when handing over the diploma. Since 2011 Lauterbach and Packbier are the fourth and fifth students who were qualified as MATSEs at Qosmotec. Both Lauterbach and Packbier will now go on to complete an academic degree at the University of Applied Science Aachen, which is combined with the apprenticeship. They will be writing their Bachelor Thesis in Scientific Programming at Qosmotec, each focusing on HF signal propagation. Their topics create an immediate benefit for the further development of Qosmotec’s QPER product range. “It feels fantastic to put scientific programming into practice”, says Simon Packbier. Meanwhile Qosmotec continues to qualify young employees. On September 1st, Felix Bengsch has started his apprenticeship as mathematical-technical software developer. The Qosmotec team whishes him a good start and every success for his education.